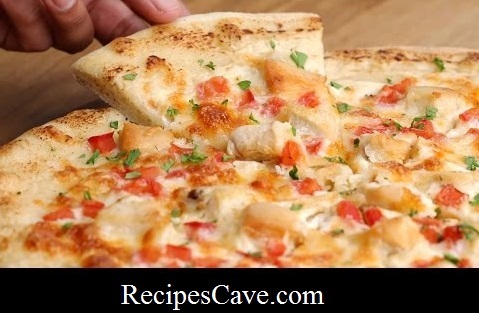 Chicken Alfredo Pizza Recipe - How to cook Chicken Alfredo Pizza just follow this simple recipe to cook as your own. 1. Preheat oven to 450°F/230°C. 2. Roll out dough to about 10 - 12 inches in diameter. 3. Top pizza with alfredo sauce, chicken, and tomatoes. 4. Bake in oven for 15-20 minutes, or until crust is crispy and cheese is melted and 5. turning golden brown. your Chicken Alfredo Pizza Recipe is ready.